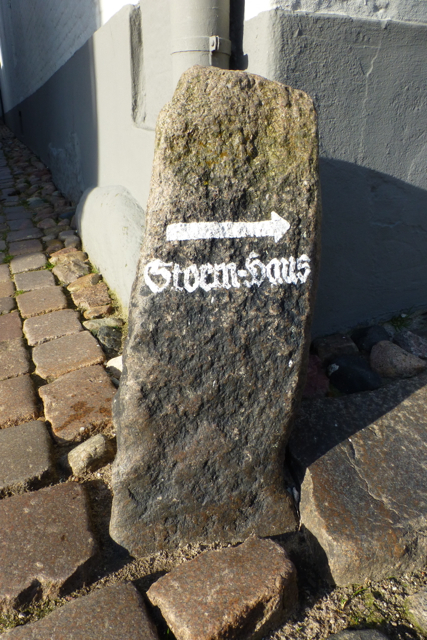 I was in Germany in March, visiting friends in Kiel, and had the chance to visit Husum, on the west coast of Holstein. It was here that the 19th century writer Theodor Storm lived for many years, and I happened to be reading his novella Der Schimmelreiter (The Rider on the White Horse), so I looked into his old house, now a museum. The copy of Der Schimmelreiter which I was reading had been given to me by a friend, who’d meant to buy an English translation but had got a German edition instead. I thought I should take some photos of the book in situ, having as it were found its way home. Later I enjoyed a reading by the poets Arne Rautenberg and Hendrik Rost at Der Speicher, an old warehouse on the quay. I spoke to Hendrik afterwards. He has three children, and said he wrote a whole book of poems on the commute between Lübeck and Hamburg, and could even quantify the time thus spent – 560 hours. Storm’s heavy wooden writing desk – a gift for this 70th birthday – offers a rather different writing environment.